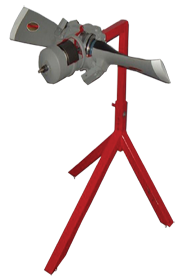 The Model EC-01 is a cutaway of a constant speed propeller hub, showing the internal mechanism for controlling the propeller pitch.The cutaway is fitted with test club short length props, and is mounted on a mobile stand. An optional CBT may be ordered with Model EC-01. The CBT courseware provides comprehensive details of the propellers of various types used on general aviation and commuter aircraft. The CBT courseware complies with EASA Part 147 Module 17 syllabus.